We are living in a world where mental illness is labeled as a myth, where people believe that being unhappy is a choice. It's 2017, and we might be on a breakthrough in medical science for neurology, oncology, etc, but even today, depression, anxiety is not even considered a medical issue. Depression is a real thing, it is not something that can easily be shaken. People dealing with depression want to tell their stories to somebody and they are mostly afraid to speak to their close friends and relatives. Others are not even bothered to help. 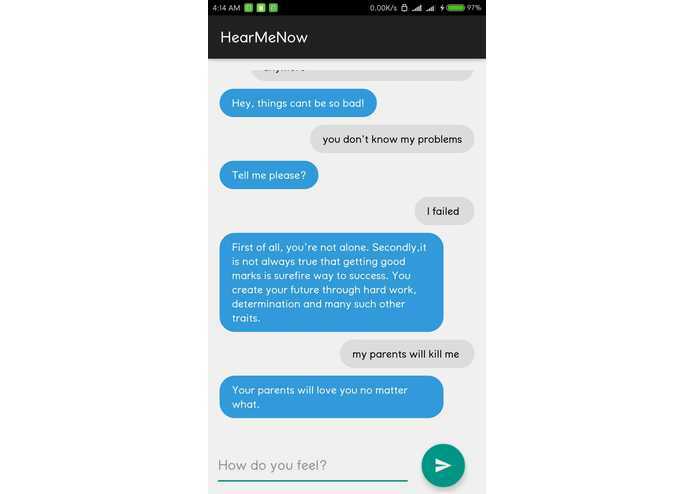 HearMeNow will talk to you like the best friend you have never met. Everyone is familiar with Humans of New York and other inspired channels. Taking the example of Brandon Stanton, founder of Humans of New York, who revealed in one of his interviews how he extracts stories out of people. He picks up a random stranger, and asks him/her few eye-roll-worthy, privacy-invading questions like “what has been the saddest moment of your life?”, and all of a sudden, this person is sharing his/her sorrows, empathy, fears with Brandon. Taking a similar approach to Humans of New York workaround, I built a chatbot that will ask you about your problems indirectly and eventually find you solutions. When you are feeling suicidal, it will connect you to actual support groups near you. Improving the bot intelligence was challenging. In the initial stages, I was experimenting with fewer intents, but with the addition of more intents, keeping track of the intents was difficult. This is a really special project because of the fact that it is dealing with such a major issue in the world right now. Even after this hack, I will continue building on this project and hopefully, I will have some credible accomplishments then.